on verso dated September 1975, March 1976 and March 1977 and inscribed "Hang on diamond"
A virtual stroll through the 62 works of art by Sir Terry Frost in the collection of Britain's Tate Museum provides us with an overview of this influential painter's output from the early 1950s until the late 1990s. Ironically, his first formal studies began when, as a prisoner of war in 1943, he met artist Adrian Heath, a fellow POW. After returning to England, Frost made the fortunate choice of moving to St. Ives in Cornwall, where many of England's most celebrated twentieth-century artists spent residencies. There and at the Camberwell School of Arts and Crafts, in London, Frost studied under and was encouraged by major artists of the post-war era, including Victor Pasmore, Ben Nicholson, Patrick Heron and sculptor Barbara Hepworth, for whom he was a studio assistant in 1951. His first solo exhibition, at the Leicester Galleries, London, in 1952, was the beginning of a long and successful career, culminating with a retrospective at the Royal Academy of Arts in 2000. 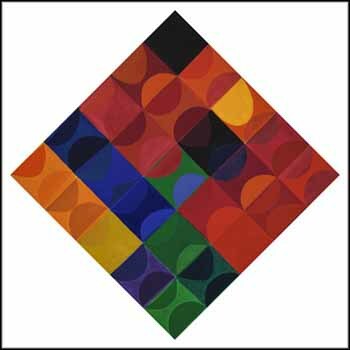 Exuberant and joyful, this untitled work is typical of Frost's paintings from the 1970s, incorporating the half-moon motifs and brilliant colour range for which he is best recognized.